Enig co-wrote another book with Sally Fallon called Eat Fat, Lose Fat which promotes what Enig considers “good” fats, including coconut, butter, cream, nuts, meat, lard, goose fat, and eggs. Enig is the co-founder, vice president, and board-member of the Weston A. Price Foundation (WAPF), started in 1999 to promote nutrition and health advice based on the work of early 20th century dentist and researcher Weston A. Price. This entry was posted in Uncategorized on November 11, 2014 by Bix. 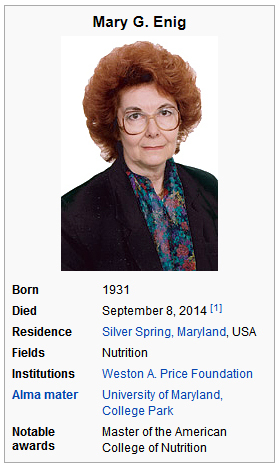 She died of a stroke so, obviousely her way of eating and her advice regarding fats is not correct. Seems the raw VEGANS are winning !